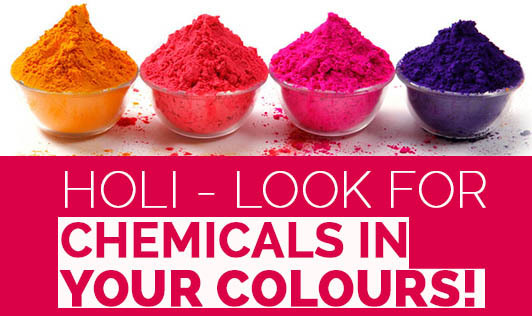 Holi - Look for Chemicals in Your Colours! Holi is a Hindu spring festival, originating from the Indian subcontinent, celebrated predominantly in India and Nepal, but has also spread to other areas of Asia and parts of the Western world through the diaspora from the Indian subcontinent, also known as the "festival of colors" or the "festival of love". The festival gets its significance from an old Hindu story and is celebrated with colors to spread the happiness of the salvation of one of the mythical characters in the story. It is a traditional festival followed throughout our country and even in some parts of the world, and is a time to celebrate with family and friends. Traditionally, Holi was celebrated with turmeric, kumkum, and bilwa and neem water. They didn't have any effect on health as such and was absolutely safe. However, today we don't really think of using natural colors because we have convenient options available. Though it's a traditional festival, the modern issues attached to it are many. Several investigations were done to test the safety of these colors today. It was found that some toxic substances used in color making have harmful chemicals such as lead oxide, oxidized metals, industrial dyes, and other toxic chemicals. They have several health impacts like temporary blindness, skin allergy, rashes on the skin, respiratory problems, eye allergy etc. It is also said that if these colors get dissolved in water bodies like rivers, and if this is eventually used for drinking purposes, it can cause renal failure if not filtered well. With growing concerns about these toxic chemicals in colors, natural and non-toxic forms are being sold today. Make sure this Holi is celebrated with natural colors. Keep yourself and your kids safe!